Atari Party was free, and open to the public! Thanks to our sponsors and volunteers for helping make it possible. Please support our local library! The prize drawing was also free. Raffle tickets will be handed out at the door at no cost. Congratulations to all the winners! Children are welcome, but must be accompanied by an adult at all times. (Sorry, no dropping off your kids!) Game controllers have long cords, so be aware of tripping and other hazards. Small parts can be found in some game and computer parts, as well as craft projects that will be set up at the event; these can present choking hazards. Note that some game or movie contents are not appropriate for young children. Almost all games predate the ESRB (Entertainment Software Rating Board), so please use your best judgement. We'll do our best to constrain overtly violent games to the conference room in the back of the open meeting space. Keep in mind that the equipment and games brought to this event are from volunteers' private collections, and are 10-30 years old, so please treat them with care! A very small percentage of people may experience a seizure when exposed to certain visual images, including flashing lights or patterns that may appear in video games. Even people who have no history of seizures or epilepsy may have an undiagnosed condition that can cause these "photosensitive epileptic seizures" while watching video games. These seizures may have a variety of symptoms, including lightheadedness, altered vision, eye or face twitching, jerking or shaking of arms or legs, disorientation, confusion, or momentary loss of awareness. Seizures may also cause loss of consciousness or convulsions that can lead to injury from falling down or striking nearby objects. Immediately stop playing and consult a doctor if you experience any of these symptoms. Parents should watch for or ask their children about the above symptoms - children and teenagers are more likely than adults to experience these seizures. If you or any of your relatives have a history of seizures or epilepsy, consult a doctor before playing. Volunteers and onlookers were welcome starting at 10:00am, when the library opened, to help set up and ready the room for the public. We had to be be completely cleaned up and out of the room by 5:30pm, when the library closed — no exceptions! Thanks for your understanding, and thanks to everyone for your assistance! We made it out with minutes to spare! The public library is located on East 14th Street, between the Veterans' Memorial Center and the Davis Senior High School. Mace beds to the left and becomes Covell Blvd. Turn left onto W Covell Blvd. Turn right onto W Covell Blvd. 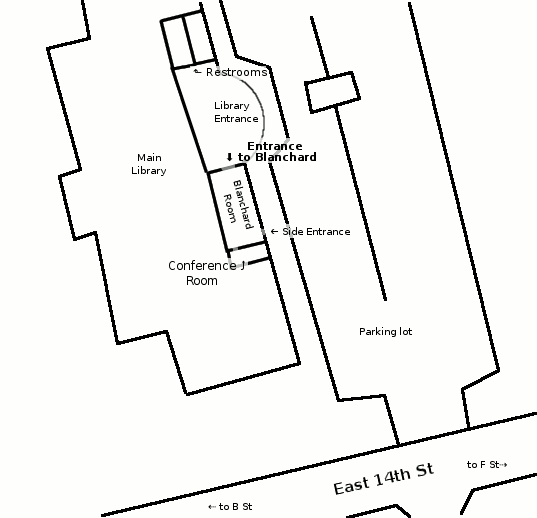 There is plenty of parking in the library's parking lot, and on East 14th Street and other nearby streets. Try Google maps public transit directions. 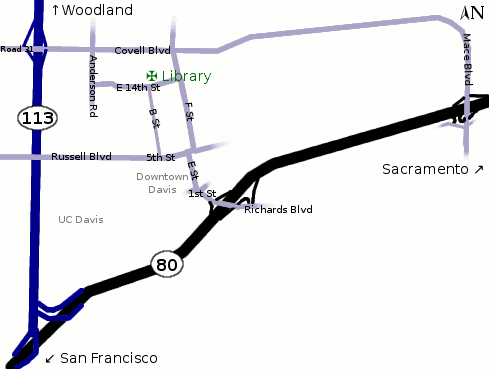 See also: "In and Around Davis" on the 'Links' page.